Rock Rips - the best rock in any language...and more! For Diamante, it's not just about the blue hair and the glitz, it's about the music. Bursting onto the scene in 2014 at just 18 years old, lead singer Diamante earned recognition for the song "Bite Your Kiss." Now, 5 years on, she's ready to take her place with the grownups. She was raised in Boston but now makers her home in L.A. We're looking forward to welcoming Diamante to our charts someday - hopefully soon. Click above to open the most recent Rock Rips chart. Delain stays on top of Rock Rips this week. And while we have no significant moves, we do have 16 countries represented! 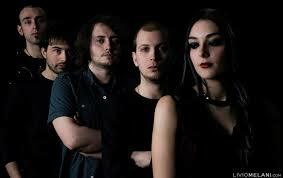 Kalidia strikes again with their newest, "Circe's Spell." Top 50 of 2017 is here! The Top 50 of 2017 is up! Yet another newcomer is #1 of the year. View this week's chart videos, in order from 1 to 20, on YouTube! We're still working on a series of playlists at our Youtube account. The first that we're pleased to present is the Rock Rips #1s of 2000 and 2001, in order from our very first chart of September 23, 2000. Step back in time and see what made us happy years ago! You've been patient - now here's what you've been waiting for. It's the top 50 artists from our charts between 2000 and 2010. The last time we published this chart was 2007 and lots has changed. Bands that slid down the chart for years, such as Default, experienced career success in recent years, and they're stronger than ever. Come look for your faves by clicking on the title above.